Enrich your home with the beauty of fine handcrafted Tuscan pottery, including world famous Majolica pottery and other styles from Italy's finest artisans. Their buyers search all of Italy for only the very best Italian ceramics and pottery. Enter the Promo Code - CATCOM15 - at checkout on the Artistica website. The artistry of a hand painted pitcher - Fine, hand painted Italian pitchers are at home in any elegant decor. Select a colorful Majolica pitcher, including the timeless Majolica rooster pitcher. Or choose a pitcher from Deruta, with over 500 years of expertise in each design and brushstroke. Italian biscotti jars - An exceptional cookie like biscotti deserves an exceptional biscotti jar. Artistica has gathered hand painted jars from Tuscany and Deruta to grace your counters and store the perfect treat to enjoy with afternoon coffee or tea. Pasta bowls and other serving pieces - Grace your meals with the elegance of a handcrafted Melograno, Raffaellesco, or Tulipano jolica bowl for your pasta, salad, or bread. Add a Majolica bowl for flowers. Choose a hand painted pitcher for water or wine, and a handcrafted serving platter for meats, cheeses or fruit. A beautiful setting for delicious feasts! Vases and urns - The beauty of Tuscan pottery and Italian majolica reaches its zenith in the graceful lines and gentle curves of a vase or urn. Select a work of art in Rustica or Majolica pottery for a dramatic accent in a living room, foyer or office. Handcrafted tableware - Set your table with fine dinnerware from Deruta, Amalfi and Faenza. Each handcrafted, hand painted piece is both a work of art and functional addition to your table. Tuscan kitchen decor and home accents - Bring the feel of Tuscany into your home with colorful clocks, umbrella stands, plaque and hand painted Majolica plates. 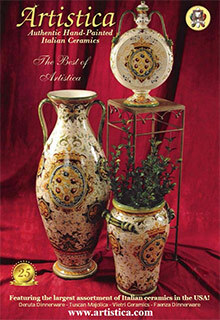 Artistica's experience as the first Italian pottery merchant on the web brings the best of Italian artisans to you with Italy's finest pottery and ceramics for your beautiful home.